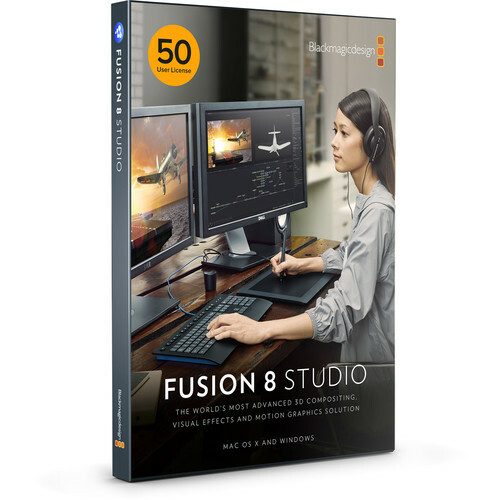 Utilizing the advantages of a Node based workflow, Blackmagic Design’s Fusion 7 Studio packs the power of a full 2D/3D software based compositing system into your computer running Windows 7 64-bit or Windows 8 64-bit. 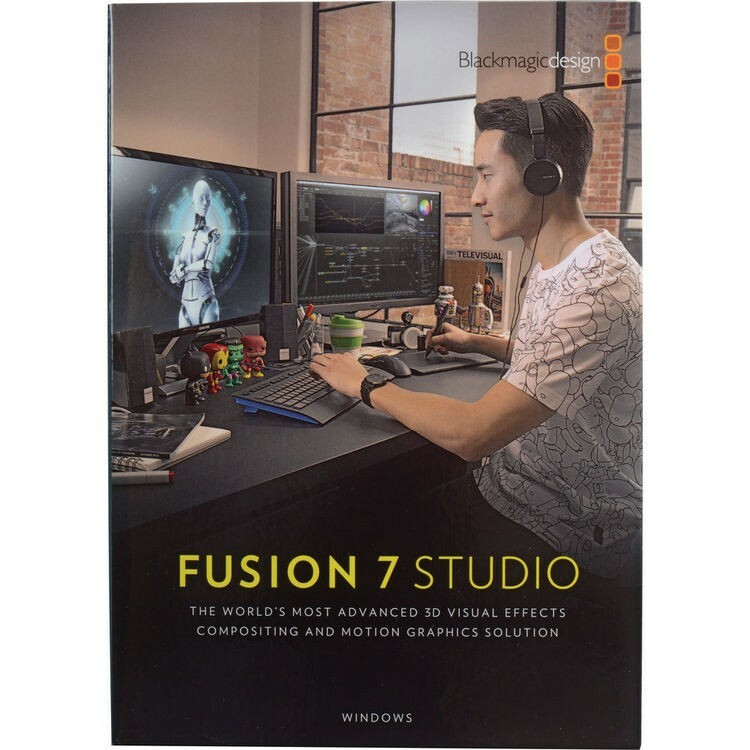 Utilizing the advantages of a Node based workflow, Blackmagic Design’s Fusion 7 Studio packs the power of a full 2D/3D software based compositing system into your computer running Windows 7 64-bit or Windows 8 64-bit. Fusion 7 Studio is essentially resolution independent supporting images over 32K x 32K, with no limits on the output resolution. Fusion 7 Studio takes advantage of GPU acceleration, moving the intense image processing computations away from your systems CPU. Fusion essentially places an entire VFX studio at your fingertips, with keyframe and spline based animation tools for controlling the image effects you apply to your footage over time. You can use the keyframe and spline tools to control the included tools, which include Keying and matte tools, particle tools, and vector paint tools. The included 2D and 3D text tools allow you to create and animate text effects from the simple to Hollywood style effects. Fusion also works in 3D space, allowing you to import 3D scenes and models created in other programs, such as Maya, 3ds Max, and Cinema 4D, and integrate them into your effects work. Fusion 7 Studio is the paid version of the software, which includes several features that the free version lacks. For example if you want to use third party plugins to augment the included tools you will need to purchase Fusion 7 Studio. Likewise, Stereoscopic support, optical flow tools, which provide more real world frame interpolation, and unlimited render nodes for rendering across a network, also require the Fusion 7 Studio license. Integrated 2D and 3D compositing an animation environment. Responsive UI with interactive, real-time rendering. Seamlessly blend floating point, 64-bit and 32-bit images without concern. Use Independent LUTs for each display view. Includes Avid Connect plugin for using Fusion from the Media Composer timeline. With its GPU acceleration, you get instant feedback while you work so you can see exactly what you’re doing. Whether you’re working alone or with a client, Fusion gives you the real time control you need so you can spend more time being creative and less time waiting. Fusion uses nodes which are small icons that represent effects, filters and other processing which can be connected together to easily build up larger and more complex visual effects. Nodes are easy to see and connect together; you can combine tools, images, and objects in any order to create unlimited visual effects. Nodes make it easy to adjust any single part of your project simply by clicking on the node and making an adjustment. Tween interpolates between two non-sequential images. Built-in 3D cameras with support for eye separation, convergence and toe in, or Parallel mode. Fusion 7 Studio includes Generation, which is a multi user management software. Generation helps you manage and track versions of every shot in your studio. You can assign tasks to artists, make notes, and see each team member’s workload to help balance the work and finish projects faster. Fusion 7 Studio also features a bin server to let everyone share and see common assets that are needed for the job. That means you don’t have to copy and track multiple elements on different computers. OpenCL Acceleration of computationally intensive tools. Cache manager work invisibly in background — no user intervention required. The GPU render outputs multiple layer types for later processing. 3D Z -Depth Blur for true depth of field focusing. Use object and material ID’s to mask the effect of any tool. OpenCL GPU accelerated for real time interactivity and rendering. Bitmap, geometric or pixel based particle styles for increased flexibility. Power Cluster predicatively renders the frames around current time during an interactive session using the remote nodes. Infinitely scalable brushes with fine softness control. Animate built-in ‘type on’ effects, rolls and crawls. Fast Noise tool for quick, high-quality noise patterns. Mandelbrot generator produces scalable fractal images. Color differences between grain channels help match non-monochromatic-type grains. Fusion’s exclusive Ultra Keyer optimized for Blue and Green screen extraction. Lens-type defocusing with blooming and NGon elements. Spline-based Color Curves tool allows look-up-table color correction for infinite flexibility. Supports over 30 image files formats including OpenEXR, DPX, TIFF, JPEG, PSD, and QuickTime. Fuses tool kit for development of OpenCL custom tools.